Not for the faint-hearted, this tour includes many regions which are off the beaten track. 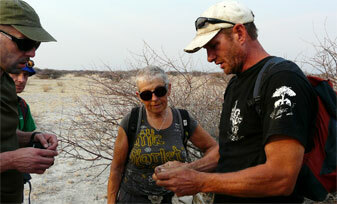 Central Kalahari Game Reserve has, until relatively recently, even been totally off-limits to the general public. This pristine semi-desert is famous for its Black-Maned Kalahari Lions and its large population of Brown Hyaenas - arguably the largest remaining in Africa – as well as wild dog, cheetah, leopard, springbok, gemsbok and ostrich. Now the world’s second largest protected area, it has been inhabited by the San for thousands of years since they roamed the lands as nomadic hunters. Pioneer researchers Mark and Delia Owens made the Reserve world-renowned with their book Cry of the Kalahari in the 1970s. Our next destination, Nxai Pan National Park, is undoubtedly one of Africa’s best kept secrets. Centered around an enormous salt pan - the northern arm of the Makgadigadi Pan - this area attracts large numbers of game, particularly elephants, which frequent this area at the beginning of the rains to take advantage of the mineral deposits. 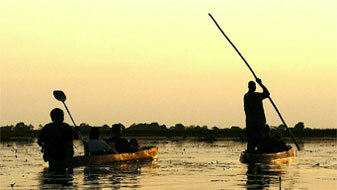 The Okavango Delta is an oasis in the Kalahari Basin – and the world’s largest inland delta. 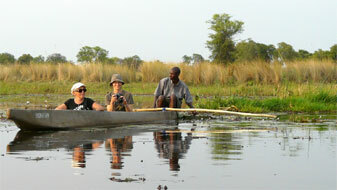 We will do as the locals do and board dug-out canoes – Mokoros – to be poled silently along a maze of narrow waterways and deeper into the delta, where we will camp. The bird life is spectacular, and we get the chance to spot elephants, lechwe antelopes or zebras on foot. Savuti needs very little introduction and is known for its large population of lions, in particular several prides which specialize in hunting elephant. The Savuti channel is flowing and once again flooding the marsh after having been dry for 28 years, a spectacle which has once again attracted animals in their thousands. 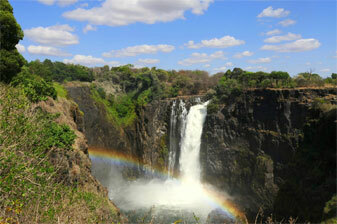 Victoria Falls, being one of the seven natural wonders of the world, is an impressive sight of its own. Called Mosi-oa-Tunya by the locals (the smoke that thunders), this phrase describes the impressive waterfall – the largest in the world - aptly. The small town of Victoria Falls is at the same time the adventure capital of the region, with the spectacular white water rafting on the Zambezi being only one of many possibilities to get on eye-level with nature’s forces. We will spend two full days here, allowing us ample time to explore the attractions as well as to relax by the pool. Transfers from Oliver Tambo International airport and pre-tour accommodation can be arranged upon request. Departing early, we travel north to cross the Limpopo River into Botswana at Martin’s drift. In transit we will stock up on essential supplies for the journey into Central Kalahari Game Reserve. Tonight we will enjoy our first camp fire at the beautiful Khama Rhino Sanctuary with its bizarre Mokongwa trees. This is Botswana’s premier rhino viewing reserve. B,D. After a morning game drive in Khama Rhino Sanctuary looking out for rhinos, we are headed for the Central Kalahari Game Reserve. After an extensive game drive, we will camp at one of the many wild sites in the southern region of the park. There are no facilities in the campsite, and, after a hearty meal around the camp fire, we fall asleep to the sounds of the wild. B,L,D. Deception Valley and nearby Piper’s Pan were made famous by the Owens’ Cry of the Kalahari. Today we will visit this area and some of the pans in the region before arriving in our campsite in the late afternoon. B,L,D. 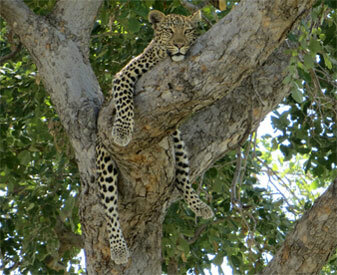 Day 5: Nxai Pan National Park. After an early morning game drive we exit Central Kalahari and travel the short distance to Nxai Pan National Park. In the late afternoon we will explore the pan and surrounding wilderness before arriving in our campsite. B,L,D. Day 6: Nxai Pan to Maun. 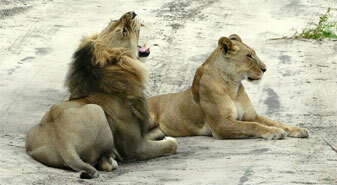 Departing early morning we will conduct a game drive before arriving in Discovery Lodge in Maun for lunch. Perched on the banks of the Thamalakane River (one of the southern arms of the Okavango Delta), this spot is an oasis in the desert. This afternoon will be spent relaxing by the pool and preparing for the journey into the northern regions of Botswana. Tonight we will have an own expense meal under the stars. B,L. Day 7 and 8: Southern Okavango Delta. The Okavango Delta, with its myriad of islands and waterways, is a wildlife paradise and no visit to Botswana would be complete without it. During these 2 days we will traverse some of the delta’s channels using traditional dugout canoes and conduct some game walks in this beautiful area. Here we have a chance to interact with some of the Bayei people who have been living in this area for centuries. B,L,D. 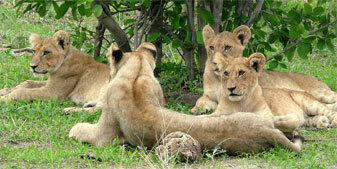 Day 9 and 10: Moremi Game Reserve. 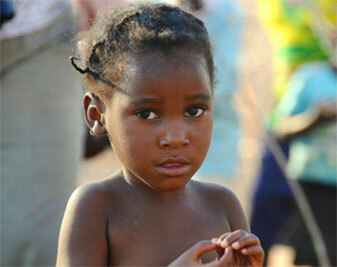 After resupplying in the bustling frontier town of Maun we will enter the world renowned Moremi Game Reserve. The following two days will be spent exploring the more remote areas of the park including Third Bridge and the Khwai River. B,L,D. This morning we will follow the course of the the Kwhai River into Chobe National Park. The Savuti channel is flowing again for the first time in many years and we will explore the river and surrounding marsh in search of the large elephant bulls which roam this area as well as a variety of plains game. B,L,D. 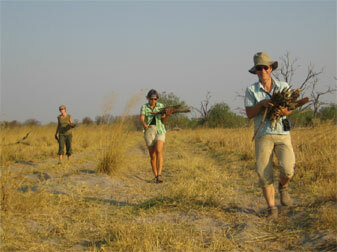 Leaving Savuti early today, we will arrive in the late morning in our campsite along the Chobe River. With its ancient baobab trees and beautiful scenery the river drive is the jewel in the crown of the park and we will spend the afternoon game viewing after relaxing in the heat of the day. B,L,D. Day 13, 14 and 15: Victoria Falls. After an extensive game drive along the river we will arrive in Kasane for lunch after which we will partake in a Chobe River game viewing cruise which is another excellent way to see the park and its abundant wildlife from the water. We then transit to Victoria Falls arriving in the late afternoon. The following 3 nights will be spent in relative luxury and will give us a chance to wash off some of the Kalahari dust. During this time we will visit the spectacle that is Victoria Falls and, for the adrenalin seekers, there is the option of many activities offered in and around the town including white water rafting on the Zambezi River. Lunch and dinners in Victoria falls will be at own expense. B. After a hearty breakfast we say goodbye to our travelling companions and transfer to Victoria Falls Airport. B.